Sikshana Foundation in association with Dell and the Government of Karnataka has launched STEP (Sikshana’s Technology in Education Program) in 57 Model Schools – Karnataka Public Schools. STEP aims at motivating schools to engage and integrate technology in their daily teaching and learning processes. The model employs a dual approach which builds the basic ICT (Information Communication Technology) skills and 21st-century skills in students and empowers teachers to leverage technology in the classrooms in an experiential manner. The same is enabled through the hardware provided by Dell & the offline content package and other inputs developed by Sikshana. STEP was officially launched by the Chief Minister of Karnataka, Mr. H.D. Kumaraswamy and Minister of Education of Karnataka, Mr. N. Mahesh on September 5th, 2018.Mr. Rudramuni B., Vice President & Head, Dell R&D India Center and Ms. Archana Sahay, CSR Head- APJ at Dell EMC and Mr. Prasanna Vadayar, CEO, Sikshana Foundation were recognized by the honorable Chief Minister for their contribution in the field of education. 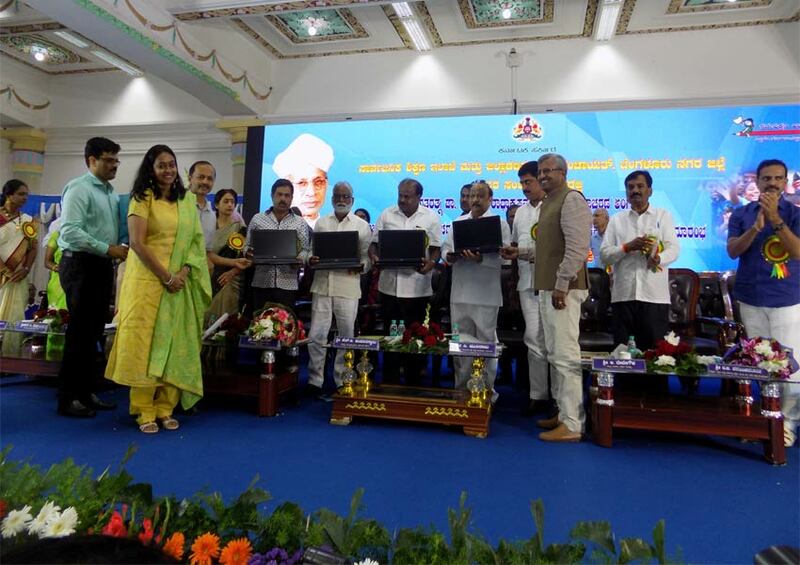 As a part of the association, Dell laptops have been gifted to the Karnataka Public Schools to train teachers and the students. Elaborating on Dell’s commitment to make digital education accessible to all, Rajeev Kapoor, India Vice President and CSR Campion at Dell said, “Technology connects people in meaningful ways and has the power to create new opportunities and boost economic growth and well-being. Dell is committed to supporting scalable and self-sustaining programs that use technology to address some of society’s biggest challenges. We are proud to partner with the Sikshana Foundation and the Government of Karnataka to launch STEM in Karnataka Public Schools. Through this partnership, we aim to help the underprivileged children learn the use of technology and new-age skills, thus enabling a brighter future”. Sikshana Foundation in collaboration with Dell has been providing STEP (Sikshana’s Technology in Education Program) since 2009. The program was started with a handful of schools and is now being offered in 300 plus schools of rural Karnataka in partnership with Dell, impacting more than 15,000 students. In August 2018 Sikshana & Dell signed a MoU with the Dept. of Education of Govt. of Karnataka for implementing STEP in 57 Model schools identified by the Govt. these schools are also known as Karnataka Public Schools. As per the MoU Dell will be providing necessary hardware for implementation of the program along with other inputs which would be developed by Sikshana Foundation.